Seas here have been a bit on the choppy side as the easterly winds continue to blow. One would think that there would be a lot of Mahi-Mahi but that hasn?t been the case. One here, a few there, continued erratic at best. 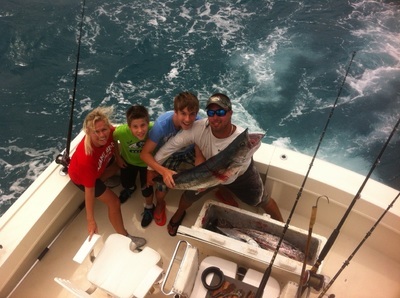 With Heidi Dietz and her boys aboard we ended up on the edge and the Fort Lauderdale reef fishing continued to produce Kingfish action. These fish are coming in all sizes, but with the majority of them being well above the minimum sixe limit. That size limit continues to be based on a fork length measurement of 24 inches from the tip of the nose to the fork in the tail. The are as many of you know many different requirements for lengths of various species. Over all length, fork length, squeeze the tail is OK, don?t squeeze the tail, tip of the nose , tip of the lower jaw. As much as we do this we still refer to the book at times to make sure we get it right. If you get stopped for a spot check here in Florida you had better have it right, licensed charter or private boats. So we don?t gaff the ones that appear as though they might not measure up, and every now and then a close one flies off the hook as it is swung into the boat. I prefer to think those lucky ones that fall off were shorts anyway and they managed to avoid the handling for hook removal before going back into the water. So it has been easier boat side as many fish are far above the minimum size and ride the gaff into the ice. 75 to 100 feet of has been best. Trolling and live baiting. Bonito, occasional Sailfish, Wahoo and Tunas as well.